Now that you’ve been using Time Machine regularly to back up your computer, you should be fully prepared if your Mac crashes or if you need to move data from one Mac to another. Restoring data from Time Machine is just as easy as backing things up in the first place. Not sure which backup might hold the last copy of your missing file? Try running a Spotlight search in Time Machine based on keywords. 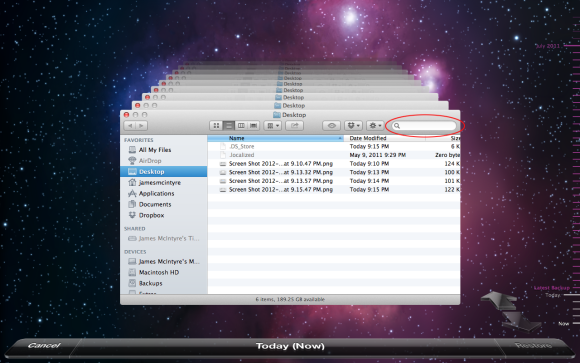 You’ll see a search field in the upper right corner of each Finder window in the Time Machine view. Type in the file name or keywords from the file, and Spotlight will search through your backups to find the latest copy. Not sure where to find the file you need? You can perform a Spotlight search in Time Machine, using the search field (circled). Once you think that you’ve found what you’re looking for, use OS X’s Quick Look to make sure: Select the file and then press the spacebar to view the file without having to launch its parent application. 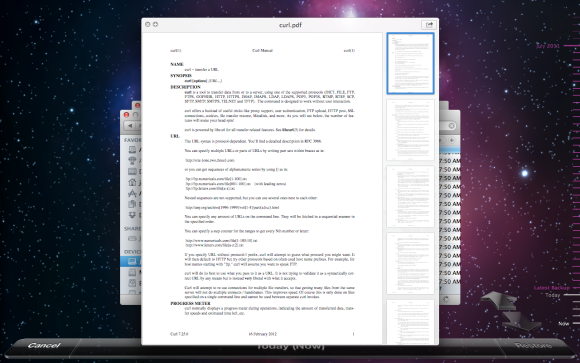 Preview a file before you restore it by using OS X's Quick Look feature. Select the file or folder, and press the Restore button. The file will automatically be copied to your desktop or to the file’s original folder. This may take some time, depending on the size of the transfer. Sometimes you may want to restore your entire system from a backup—say, in the event of a crash or when your computer is misbehaving and you’d like to dial the clock back to a kinder, gentler time. If that’s the case, first connect your Time Machine drive. Then start up your Mac from the Mountain Lion recovery partition by pressing (and holding down) Command-R at startup. This launches Recovery Mode, a portion of your drive that Mountain Lion treats as a separate volume. It includes a few essential utilities for restoring files in case of a problem. For this approach to work, you must have a complete Time Machine backup that includes all system files. Click Continue until you reach the Select a Backup Source window. here, select your Time Machine drive and click Continue. In the Select a Destination window, choose your Mac’s hard drive. (Using Recovery Mode erases your Mac’s hard drive before restoring from Time Machine; but once the process is finished, you’ll be able to log in and use your Mac normally). Let’s say that you bought a new Mac and want to transfer all of the data from your old system to it. Or imagine that you simply want to transfer data from one Mac to another. 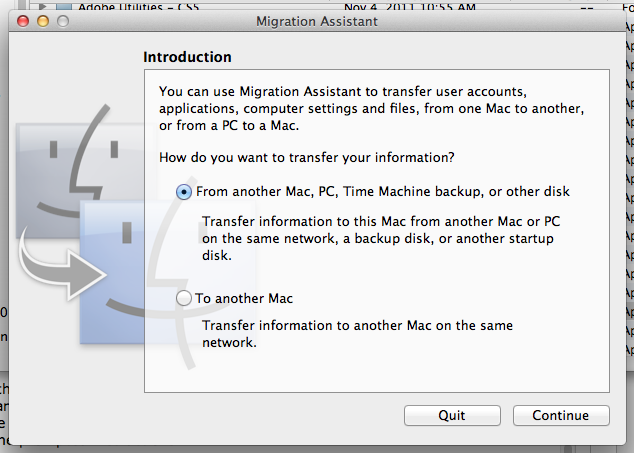 Time Machine can help here, too, but with the assistance of another built-in Mountain Lion utility called Migration Assistant. Use OS X's Migration Assistant to transfer data from a Time Machine backup to a another computer. Once your backup drive is connected, launch Migration Assistant (in your /Applications/Utilities folder). A Migration Assistant window will appear and ask how you want to transfer your information. Choose the From another Mac, PC, Time Machine backup, or other disk option and then click Continue. You may be prompted to enter your administrator’s password. Do so, if necessary, and click Continue. Next, you’ll be asked to quit other applications. Do so, and click Continue. In the next window, select the From a Time Machine backup or other disk option and click Continue. Select your backup drive and enter a password for it, if necessary. Then choose which items you’d like to migrate (chances are, your choice will be to move everything). Click Continue, and your files will begin to transfer. For more tips about using Migration Assistant, see "Move data from an old Mac to a new Mac."